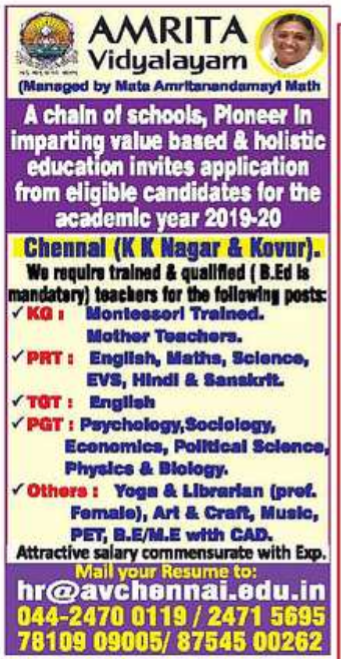 Amrita Vidyalayam,K.K Nagar,Chennai has advertised for the recruitment of Teaching Faculty- KG,PGT,PRT,TGT jobs vacancies. Interested and eligible job aspirants are requested to apply immediately.Check out further more details below. 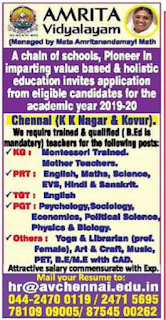 Name of the School: Amrita Vidyalayam,KK Nagar,Chennai. About School: Amrita Nesapakkam - Amrita Vidyalayam is a Co-Ed school in Ashok Nagar with CBSE Affiliation in Chennai. 2019-20 Form issue begins Dec 20,2018. Get reviews, fee details and rating. Age criteria for PreKG is 2 Yrs 6 Mths by 1st June. To provide education and mould the nature of the younger generation through of learning so that they achieve progress and prosperity in life. They vision a society whichh is healthy breeding ground which is sprouting, culturing of the whole gamut of knowledge in a wholesome and holistic matter fot the well being of human kind. Qualified and Trained candidates can apply. Salary Package:Attractive salary commensurate with experience.